Serve nostalgia, neat or on the rocks. With their distinct silver rim hearkening back to 1960s design, these glasses lend an executive style and boldness to Whiskey drinking. Serve nostalgia, neat or on the rocks. With their distinct silver rim hearkening back to 1960s design, these glasses lend an executive style and boldness to Whiskey drinking. Mouth-blown, lead-free glass. Hand wash only. Do you also ship to europe? BEST ANSWER: Yes we do. We have a third party that handles our international orders. Once you place the order online at checkout you will see an international tab and this will provide the total cost with shipping,tax and duties. Thank you for shopping with us today. Are these Madison Avenue Whiskey Glasses dishwasher safe? I don't see anything about that in the product offering, only in the reviews. BEST ANSWER: Not really. They can handle a wash or two, but after a while the silver loses its sheen and permanent spots set in. I've had these glasses for about two years now and they hold up really well as long as you hand wash them. They are not dishwasher safe. That beautiful silver ring will begin to disintegrate otherwise. They are very striking and are probably worth the effort to hand wash.
Good question because it does not say anywhere. Personally, I would think the rim would eventually fade in time from the harsh dishwasher soap. I hand wash. Sorry, we only hand-wash these so I don't know if they're dishwasher-safe. They're worth the effort, though; we get tons of compliments on them! No, they must be hand washed. My first set were ruined in the dishwasher so I bought a second set and I only hand wash them and they are fine. We do not put them in the dishwasher ever. I believe that they are not dishwasher safe if I remember our research correctly. I've put them in the dishwasher plenty of times, even on "Hot Wash" & "Anti-Bacteria" combo wash, and they come out fine. We only hand wash them. They look great and we did not want to chance the dishwashing detergent to dull their finish. Yes, they are. I've owned these for 14 months now and put them in the dishwasher after nearly every use without issue. To preserve the silver trim I would say no. I have always hand washed. I gave it as a gift but would think it would be better to hand wash.
Do you know if the Madison Avenue Whiskey Glasses are freezable? No, these glasses cannot be put in the freezer. Any idea of the weight of these? I'm looking for a heavy glass. BEST ANSWER: The listed shipping weight for both glasses is 1 lb. That would place the glasses at an individual weight of 8 ounces or .5 lbs. Thank you for your question, as stated in a previous answer below the average weight would be about 8oz. I hand washed these, but the silver lining is coming off. Is this common? BEST ANSWER: I would say it can happen and you definitely want to use a non abrasive soap as this will happen less often when doing so. Yes it is commone because these are cheap. Madison Avenue Whiskey Glasses- would the top allow a 2,5" ice ball inside of it? BEST ANSWER: Yes according to several reviewer and the overall capacity of the glass there is more than enough width to accommodate a 2-1/2" ice ball. If you are saying a 2.5" ice ball yes that will fit. BEST ANSWER: The Madison Avenue Whiskey Glasses (Set of 4) with the silver rim are the only ones we carry. We do carry the World Map Glasses (Set of 4) which have gold rims. Do you ship to Brazil? If so, what is the extra cost? BEST ANSWER: Yes we do ship internationally, simply place items in your cart and after you move to the check out screen there will be a tab below for International Shipping to complete the order. Do you ship to Canada? If so, what is the extra cost? BEST ANSWER: Yes we do ship to Canada, on the checkout screen you will see at bottom of that screen an International Checkout tab. This will direct you to a site that will provide all the shipping, duties & taxes that are applicable. The catalog I received shows these (#776 40) as available in either a silver or gold rim. I want the gold rim but cannot find them on your website. what are the base and top diameters of this glass? BEST ANSWER: Thank you for your question, the diameter for the top of the glass is 3.25" and the bottom 2.75". HOW MANY OUNCES DO THESE GLASSES HOLD? BEST ANSWER: Thank you for your question. Each glass holds 17 oz. So pleased with these glasses the first month! Looking like the famous Sacha Brastoff crystal with platinum rims of the 60s, they are the right size for male hands. Unfortunately the silvering is long gone from the original set as well as the replacement set WE so graciously rent in replacement. Leave them on the bar shelves to be admired. These whiskey glasses are a great addition to my library! They are very well made and look stunning. I constantly get compliments on how good they look. 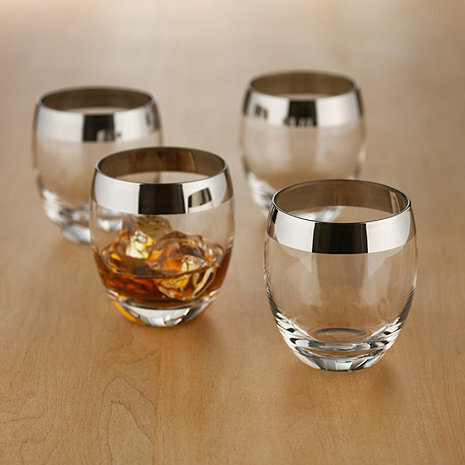 Beautiful glasses for scotch or bourbon. Easy to clean, but have to be washed by hand. Love them. We use these glasses for Bourbon. They are elegant and functional. really liked these. nicer than i expected. Bought these for my fiancé's birthday and I can't wait to give them to him. They are much more substantial then they look online (fiancé is notoriously clumsy and I didn't want anything too delicate). I would definitely recommend these. They are going to look wonderful on his bar cart. Uneven trim around the rim, completely unacceptable. I am embarrassed to have purchased these.